Officials at the signing ceremony held in Abu Dabi. 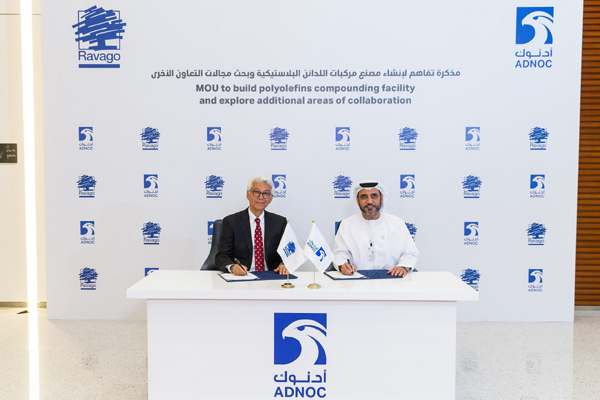 Ravago Group, a leading service solutions provider in the global polymers and chemicals market, has signed an agreement with Abu Dhabi National Oil Company (Adnoc) which will see the Belgian group build and operate a state-of-the-art polyolefins compounding facility in Ruwais Industrial Complex near the UAE capital. Ravago’s manufacturing segment, operates 24 plants across four continents, producing plastics, rubbers and chemicals, serving the automotive, electronics, and building and construction industries through the company’s global distribution network. The agreement was signed at Adnoc’s Downstream Investment Forum, where the Abu Dhabi firm revealed plans to significantly enhance and expand its downstream operations in support of its ambition to become a leading global downstream player. The duo said as per the agreement they will discuss further opportunities to unlock value and growth within the petrochemical value chain as part of Adnoc’s downstream expansion. As part of Adnoc’s efforts to maximise value across its value chain, they will explore ways to upgrade and commercialise the non-prime product generated at Borouge, the joint venture between Adnoc and Austria-based Borealis. This process, known as compounding, would take place at the proposed facility, situated in the Ruwais. Borouge is a leading petrochemicals company that provides innovative plastics solutions for the energy, infrastructure, mobility, packaging, healthcare and agriculture industries. With 4.5 million tonnes of annual capacity, Borouge is the world’s largest integrated polyolefin complex, with the ambition to more than double its current capacity by 2025. Abdulaziz Abdulla Alhajri, the director, Downstream Directorate, Adnoc, said: "We seek to create partnerships with those who can bring additional value to our hydrocarbon resources, downstream assets and the UAE economy at large." "This proposed collaboration with Ravago is an excellent example of a partner bringing world-class technologies and expertise to complement Adnoc’s strengths, unlocking conversion value and creating efficiencies, for the benefit of both partners," he noted. Ravago CEO Theo Roussis said this project confirms the group's commitment to the region and its legacy business, recycling, compounding and distribution.